Being a ham and an avid QRP-operator, I love new challenges in the radio hobby. I’ve decided to give Ultralight MW-DXing a really serious effort this year. I’m excited about the definition of Ultralight DXing, the heart and soul of the whole concept, which states that the DXer who are using ultralight equipment “...intentionally limit the capabilities of their equipment to increase the challenge and to highlight DXing techniques and knowledge…”. Well, to me this means that Ultralight DXing is the BCB-DX relative to QRP-operating in amateur radio. QRP-operators are very often saying that “power is no substitute for skill” – which is true, and that “less is more” or just “QRP IS!!”. Well, all of this is true and indeed applicable also in Ultralight DXing. Less definetely IS more and large monster antennas in combination with sophisticated receivers is no substitute for skill. Sure, big antennas and multi-buck-receivers really helps – but the most important parameters in being a successful DXer is access to a quiet QTH, a pair of good ears and skillful DXing-techniques. 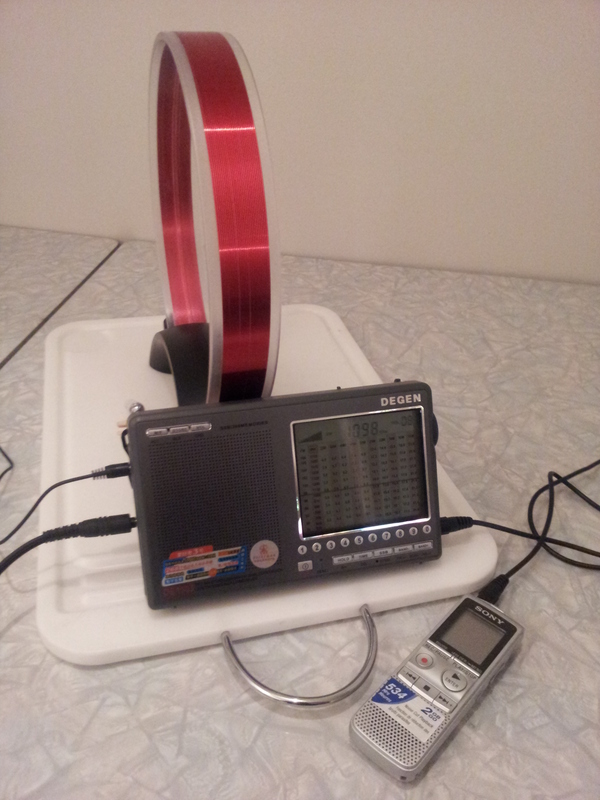 In the late winter / early spring 2012, I used my Degen DE-1103 in combination with the Tecsun AN-200 passive loop antenna. Although the DE-1103 isn’t a “true” ultralight radio (it’s a fraction too “big” and it is capable of receiving SSB), it still gives quite a good picture of what can be heard with very simple equipment. The upcoming season I will use a modified Tecsun PL-380 receiver, which is considered to be a very good ultralight radio. More about the modifications later on this site. It will be interesting to explore this wonderful new aspect of the DX-hobby! 531 22.3 2222 Jil FM, Algeria. Youth programme and hiphop music. 630 23.3 2035 CNR 2. Talks. 639 23.3 2037 CNR 1, Beijing. 657 6.3 2230 Reshet Bet, Israel. Commercials. 657 20.3 0034 Asianet Radio, UAE. Very good when local pest Murmansk was nulled out! 666 30.3 1812 All India Radio, Delhi. Played Black Eyed Peas! 1830 ID and EE-nx. 675 30.3 1840 Radio Free Libya, Benghazi. Phone-in programme. 693 23.3 2042 Shaanxi PBS. Phone-in programme. another CC-stn in background. 711 23.3 2058 Vo Kuanghua, Taiwan. Chinese popular ballads. 729 23.3 2108 ERA Net, Greece. Announcements in greek. 729 23.3 2109 Jiangxi PBS, with talks. Fighting with ERA Net. 738 1.4 1738 WRN Relay Station, Moscow. CRI-programming and ID. 738 1.4 1752 Jilin PBS. Full hour ID “Jilin renmin guangbo diantai”. 756 21.3 2330 Unid with nonstop arabic music. Presumeably Lebanon. 756 23.3 2115 CNR 1, when Deutschlandfunk and arabic stn was nulled out. 792 23.3 2125 Guanxi PBS, Phone-in youth programme. 801 22.3 0013 Radio Bahrain, with talks and announcements. Perfect ID 0049! 846 1.4 1807 Radio Radonezh, Noginsk. Religious/orthodox programming. Monks chanting. C/d 1859. 882 21.3 2245 TWR India / Puttalam, Sri Lanka. Strong with religious programming. 882 21.3 2246 BSKSA Qu’ran Programme, Damman. Good when TWR was nulled out. 936 23.3 2143 Syrian Radio 1, Homs. Good when IRIB Urumiyeh was nulled out. 945 23.3 2145 Galei Zahal, Yavne. Good signal! Good music! 972 21.3 2233 VoA / Radio Aap Ki Dunyaa. Via Orzu, Tajikistan. Strong in Urdu language. 981 23.3 1935 CNR1. Strong, as usual. 1008 23.3 2159 CNR 1. TS and announcements on the full hour. 1017 19.3 2130 Radio Iran, Bandar Abbas(?). Diskussion programme. 1035 19.3 2145 Radio Eli, Tartu, Estonia. Religious programming in russian. 1098 19.3 2122 Bayrak Radyosu, Cyprus. As usual with turkish popular music. 1098 23.3 1920 CBS, Taiwan. Superb signal with talks about Taiwan in chinese. 1107 20.3 1631 Xinjiang PBS, Urumqi. Good in sunset with px in uighur language. 1107 23.3 1930 RTA, Kabul, Afghanistan. Strong with announcements. 1134 20.3 0015 Radio Kuwait. Strong, with talks about conflict in Syria. 1152 30.3 1942 Ras Al Khaimah BC Stn, UAE. ID “Bangla Radio UAE”. Good when Romania was nulled out. 1188 20.3 0008 Radyo Payam, Iran. Iranian popular music. 1206 19.3 2210 Reshet Bet, Acre, Israel. Politcal talks. 1233 25.3 1905 Radio Monte Carlo Doualiya, Cyprus. Arabic version of “My Way”… spectacular! 1242 23.3 1950 JOLF NBS, Tokyo. 1952 announcement for “All Night Nippon” show. 1242 30.3 1729 All India Radio, Varanasi. Announcements and ID in hindi. EE-nx 1730. 1269 20.3 0020 Radio Asia, Ras Al Khaimah, UAE. Hindi/Indian ballads. 1287 26.3 1758 Unid with c/d and anthem. Presumeably Bishqeq, Kyrgysztan. 1296 6.3 2129 Sudan, pretty good with vernacular music. 1296 12.3 0112 Sudan, w/ canned ID “Id’haat Sudanye”. 1296 19.3 2055 Sudan. Very common station. Vernacular music and songs by young girls. 1296 26.3 1744 VoA / Kabul, Afghanistan. Strong with talks in EE and Pashtu. 1305 19.3 2355 Galei Zahal, Rosh Pina, Israel. Good! 1314 23.3 1835 Antena Satelor, Timisoara, Romania. Talks, announcement and ID. 1350 26.3 1900 Radio Orient, Lyon. ID in FF, continued programme in arabic. TWR was nulled out. 1368 19.3 2345 Radio Iran, Gorgan. another strong signal this evening. 1377 25.3 2149 CNR 1. Incredible strong signal from one of those super-TX:s! 1422 30.3 1758 CNR 1. XJ-tx? Strong! 1431 19.3 2341 Radio Sawa, Djibouti. Canned ID. Strong! 1485 19.3 2330 Radio Merkurs, Riga, Latvia. Oldies. 1485 25.3 1955 Onda Cero Radio, Antequera, Spain. Political talks. 1530 25.3 1825 Radio Constanta, Romania. Played Belinda Carlisle. Many ID:s.
1530 25.3 2138 VoA / Sao Tomé. Country Hits USA. Strong! 1539 19.3 2304 VoA / Radio Aap Ki Dunyaa, Al Dhabbaya, UAE. Usual propaganda. 1548 19.3 2305 Radio Sawa, Kuwait. Huge signal! 1550 30.3 2115 Radio Nac. RASD, Algeria. Arabic and spanish px. Good. 1557 23.3 1857 Family Radio, Taiwan. Announced www-adress in chinese. 1566 23.3 1805 HLAZ, FEBC Jeju. Very strong in russian language. 1566 23.3 1859 AIR Naghpur, mixed with HLAZ. 1575 19.3 2307 Radio Farda, Al Dhabbaya, UAE. Also a huge signal! 1584 19.3 2308 Radio Iran, Maku. Talks. 1593 19.3 2233 VoA / Radio Free Iraq, Kuwait. Usual propaganda. Nice catches especially Nagpur on 1566 in India. I think I may have logged that from Newfoundland’s Signal Hill on an Ultralight also a few years ago but at the time heard no ID to confirm it. . Thanks, Allen! Well, Naghpur-1566 is very common over here. Together with HLAZ-1566 and Family Radio Taiwan-1557, it’s regularly heard, even on receivers with just the internal loopsticks. I think JOLF-1242, Xinjiang PBS-1107 and Jilin PBS-738 was pretty good surprises, considering the equipment I was using. Also AIR Delhi-666 was quite unexpected, hi! I know this blog post was a year old, but I just found it. I enjoyed this ‘ultralight’ DX list, as it shows what can be heard from Vardø with a DX portable radio and loop, (as opposed to reception using a tabletop DX radio / SDR / with beverage antenna). I’m curious as to whether MW reception from over the Pole is possible with your ultralight / loop combination. Or is trans-Polar reception only possible with beverage antennas? Thanks for your comment, and sorry for the VERY late reply. Yes, MW reception of North American AM-stations over the Pole is indeed possible with the Ultralight receiver / loop combo. I regularly (i.e. almost every morning during the winter) receive both 1000-KOMO and 680-KBRW on my PL-380 iductively coupled either to my ALA-1530, Quantum loop v2.0 or 12″ x 7.5″ Ferrite Sleeve Loop, and that’s in my home – in a pretty populated area with lots of “urban noise”. This season, conditions has been very poor for signal paths over the pole, due to the current solar conditions, but as I said, I regularly receive a couple of the most common stations. This weekend I will bring my gear to a very quiet location, and I’m pretty sure that I will hear a lot more with a much lower level of “human made noise”. The key for successful trans polar reception is either a very quiet location or very good conditions or, if possible, a combination of both. An antenna farm with numerous 1000 meter beverages in all possible directions is not a must for receiving trans-polar signals, unless your object is to chase daytimers on the graveyard frequencies from my location, hi!